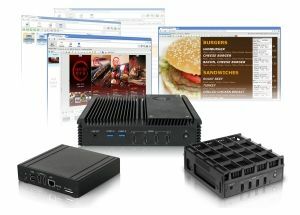 DT Research, Inc. has a new line of digital signage players, the MA Multi Screen Appliance series. The embedded system players are packaged with the WebDT Content Manager (WCM) software suite, which includes a menu board design tool, Menu Board Editor, to quickly deploy menu boards, transportation signage, and other multiple screen applications. The DT Research multi screen appliances. The MA Signage Appliances provide multiple video connections with two to seven HDMI ports for up to 1080p or 4k high resolution digital signage applications. The MA1363C/1363B offers the Intel Celeron/Core i7 CPU, integrating 3 video out connectors with 3840x2160 (@24Hz) or 1920x1080 (@60Hz) resolution in a fanless package weighing less than six pounds. The MA1367C/B offers the Intel Celeron/Core i7 CPU, integrating 7 video out connectors with 3840x2160 (@24Hz) or 1920x1080 (@60Hz) resolution, packaged in a sealed chassis with an external fan for protection from airborne contaminants. The MA1352/1356 is powered with the Intel Celeron Quad Core CPU and has 2/6 video out connectors housed in a solid-state, fanless design weighing less than three pounds. The MA102/104 has ARM CPU with Android operating system and can power 2/4 screens with 3840x2160 or 1920x1080 resolution to each screen. With Microsoft Windows Embedded 8 Standard or Android operating systems, the MA Signage Appliances can integrate with existing database and management systems, and offer an optional Wi-Fi dipole antenna for network connection.